The history of Lt. Gen. Nathan Bedford Forrest is intricately intertwined with the history of the Forty-sixth Alabama Regiment Volunteer Infantry. When the Forty-sixth was under siege in the Vicksburg campaign, Forrest was there. When they were fighting at Lookout Mountain and Missionary Ridge, Forrest was there. When the Forty-sixth provided the rear guard for Hood's retreat from Nashville, Forrest was there also, providing cavalry support. 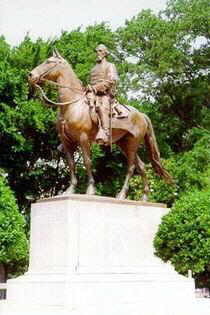 Many cavalry troops from Alabama rode with "Old Forrest" throughout his illustrious career. Several Alabama Cavalry Regiments served with distinction in Forrest's Cavalry. Forrest's military genius is unquestionable, his valor is undeniable, his patriotism unflagging. General Sherman, the most despised of all Union generals, was so concerned with Forrest and so respected his skill and war-making abilities that he devoted entire armies to the destruction of Forrest. He remarked that he would sacrifice 10,000 men and bankrupt the Federal Reserve to kill the one he considered the greatest general on either side of the conflict. Nathan Bedford Forrest was born July 13, 1821, in Bedford County, Tennessee, the son of William and Marian Beck Forrest. Beginning as a blacksmith and farm laborer he became a horse and slave trader. He went on to make a considerable personal fortune dealing in real estate before the onset of the Civil War. Initially he enlisted in the Confederate Army in 1861 as a private, but then set about to raise and equip a mounted battalion at his own expense. He served with distinction at Fort Donelson, and led his men to safety when the irresolute garrison commanders decided to surrender to Union forces under Ulysses S. Grant. Forrest was wounded while covering the Confederate retreat following the Battle of Shiloh, and was made brigadier general in July 1862. He conducted many successful raids on the Union lines of communication and specialized in delivering surprise attacks on isolated Union garrisons which yielded many prisoners and caused Federal authorities much aggravation. After the Chickamauga campaign in August and September of 1863, Forrest quarreled with his superior, General Braxton Bragg over the latter�s failure to follow up his victory at the Battle of Chickamauga. President Jefferson Davis resolved the dispute by promoting Forrest to major general and assigning him to an independent command in northern Mississippi and western Tennessee. In April 1864 Forrest was in charge of the Confederate troops that had surrounded Fort Pillow, Tennessee. Charges of massacre were soon raised concerning the affair, in which many black troops were alleged to have been killed after the post was captured. Forrest�s most impressive victory came at Brice�s Cross Roads in Mississippi, where, against a force over twice the size of his own, he succeeded in putting his enemies to confused flight. After Lee and then Johnston surrendered their forces in April, 1865, Forrest finally gave up the fight. His was the last organized command to surrender east of the Mississippi River. Following the war he acquired a plantation in Tennessee, dabbled unsuccessfully in the insurance business, and later became involved with the Ku Klux Klan. He accepted the title of Grand Wizard in that in May 1867, but left the organization after its activities became too violent. He became a railroad executive in the 1870s. Nathan Bedford Forrest died on October 29, 1877. 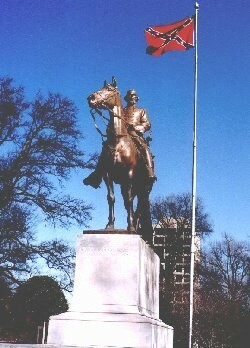 The name of Nathan Bedford Forrest has been besmirched in recent years by the same class of people who seek the eradication of the Confederate Battle Flag, the removal of all statues of the great leaders of the South, and the cleansing of The Confederate War for Independence from all of history. That Forrest was a great leader cannot be denied, he was praised during and after the war by even the New York newspapers. Therefore they seek to portray him as an evil rascist because of his brief affiliation with the Ku Klux Klan. History also casts Forrest as a murderer in the Yankee accounts of the capture of Fort Pillow. The facts don't support the reports of the alleged massacre, indeed, they undermine they accounts of the Yankee officers and others who testified before Congress about the raid. 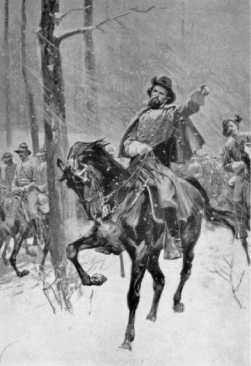 Regardless of how history remembers this great man, Nathan Bedford Forrest rode with honor and gallantry, striking terror in the hearts of his adversaries and inspiring trust and admiration among those who rode with him. SOLDIERS: By an agreement made between Lieutenant-General Taylor, commanding the Department of Alabama, Mississippi, and East Louisiana, and Major-General Canby, commanding United States forces, the troops of this department have been surrendered. I do not think it proper or necessary at this time to refer to causes which have reduced us to this extremity, nor is it now a matter of material consequence to us how such results were brought about. That we are beaten is a self-evident fact, and any further resistance on our part would justly be regarded as the very height of folly and rashness. The armies of Generals Lee and Johnston having surrendered, you are the last of all the troops of the Confederate States Army east of the Mississippi River to lay down your arms. The cause for which you have so long and so manfully struggled, and for which you have braved dangers, endured privations, and sufferings, and made so many sacrifices, is today hopeless. The government which we sought to establish and perpetuate, is at an end. Reason dictates and humanity demands that no more blood be shed. Fully realizing and feeling that such is the case, it is your duty amd mine to lay down our arms -- submit to the powers that be, and to aid in restoring peace and establishing law and order throughout the land. The terms upon which you were surrendered are favorable, and should be satisfactory and acceptable to all. They manifest a spirit of magnanimity and liberality, on the part of the Federal authorities which should be met on our part by a faithful compliance with all the stipulations and conditions therein expressed. As your commander, I sincerely hope that every officer and soldier of my command will cheerfully obey the orders given, and carry out in good faith all the terms of the cartel. Those who neglect the terms and refuse to be paroled, may assuredly expect, when arrested, to be sent North and imprisoned. Let those who are absent from their commands, from whatever cause, report at once to this place, or to Jackson, Miss. ; or, if too remote from either, to the nearest United States post or garrison, for parole. Civil war, such as you have just passed through naturally engenders feelings of animosity, hatred, and revenge. It is our duty to divest ourselves of all such feelings, and as far as it is in our power to do so, to cultivate friendly feelings towards those with whom we have so long contended and heretofore so widely but honestly differed. Neighborhood feuds, personal animosities, and private differences should be blotted out, and when you return home, a manly, straightforward course of conduct will secure the respect of your enemies. Whatever your responsibilities may be to Government, to society, or to individuals, meet them like men. The attempt made to establish a separate and independent confederation has failed, but the consciousness of having done your duty faithfully and to the end will in some measure repay for the hardships you have undergone. In bidding you farewell, rest assured that you carry with you my best wishes for your future welfare and happiness. Without in any way referring to the merits of the cause in which we have been engaged, your courage and determination as exhibited on many hard-fought fields has elicited the respect and admiration of friend and foe. And I now cheerfully and gratefully acknowledge my indebtedness to the officers and men of my command whose zeal, fidelity and unflinching bravery have been the great source of my past success in arms. I have never on the field of battle sent you where I was unwilling to go myself, nor would I now advise you to a course which I felt myself unwilling to pursue. You have been good soldiers, you can be good citizens. Obey the laws, preserve your honor, and the Government to which you have surrendered can afford to be, and will be, magnanimous.